The ADXL362 always provides 12-bit output resolution; 8-bit formatted data is also provided for more efficient single-byte transfers when a lower resolution is sufficient. Measurement ranges of ±2 g, ±4 g, and ±8 g are available, with a resolution of 1 mg/LSB on the ±2 g range. For applications where a noise level lower than the normal 550 µg/√Hz of the ADXL362 is desired, either of two lower noise modes (down to 175 µg/√Hz typical) can be selected at minimal increase in supply current. In addition to its ultralow power consumption, the ADXL362 has many features to enable true system level power reduction. 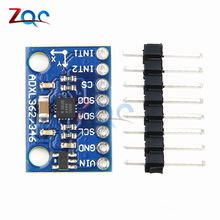 It includes a deep multimode output FIFO, a built-in micropower temperature sensor, and several activity detection modes including adjustable threshold sleep and wake-up operation that can run as low as 270 nA at a 6 Hz (approximate) measurement rate. A pin output is provided to directly control an external switch when activity is detected, if desired. In addition, the ADXL362 has provisions for external control of sampling time and/or an external clock. The ADXL362 operates on a wide 1.6 V to 3.5 V supply range, and can interface, if necessary, to a host operating on a separate, lower supply voltage. The ADXL362 is available in a 3 mm × 3.25 mm × 1.06 mm package.